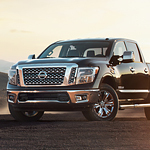 Categorized into the light-duty class, the Nissan Titan XD is a pickup truck that's available in multiple cabin designs. You can let Nissan North install custom mechanical, electronic and other accessories in this tough vehicle. A Class III hitch receiver for towing is available for this versatile Nissan model. Having a classic 7-pin harness for electrical wiring, this component is designed for a 3,500-pound load. You can also buy a Class IV tow hitch receiver for enhanced towing performance on the highway. A hitch ball and mount with the Class III label are some other custom accessories that may be installed for towing. A weight-distributing hitch assembly with Class IV and Class V ratings is optional for the Titan XD. These metal components prevent the bed and chassis from dropping too low on the road. The maximum towing capacity of the custom hitch and ball package is 10,000 pounds.